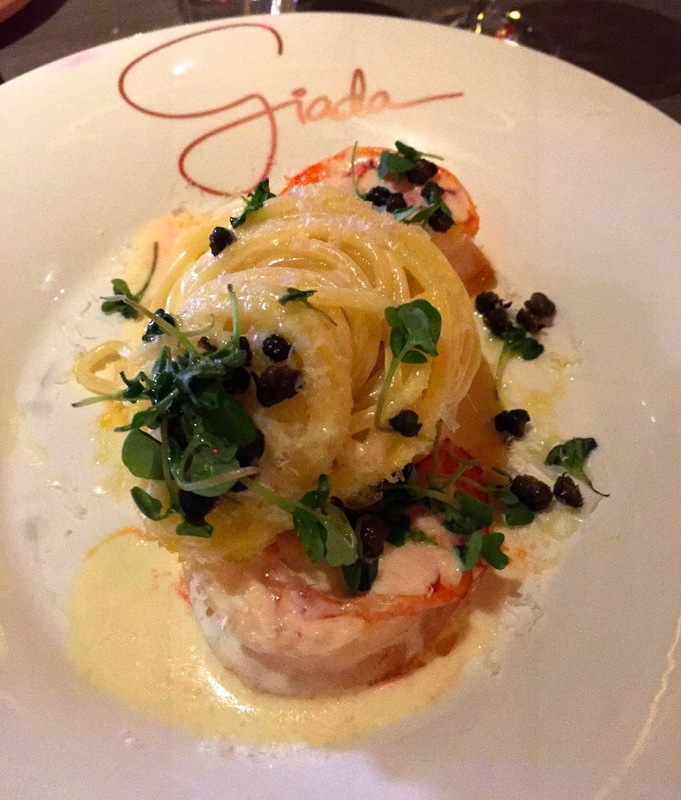 LAS VEGAS DAZE: Giada Restaurant Revisited! 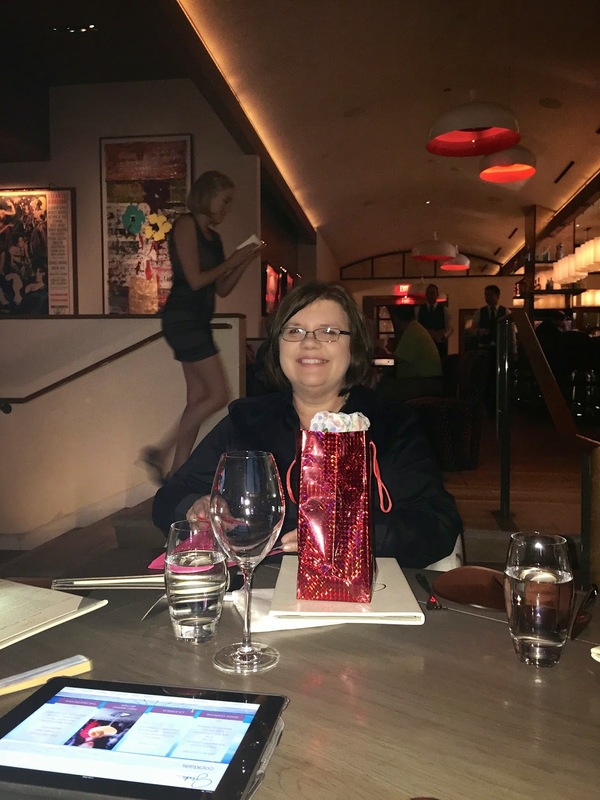 I had so much fun eating at Giada's last September with friends I was happy when it was decided we would eat there during the April Meet. 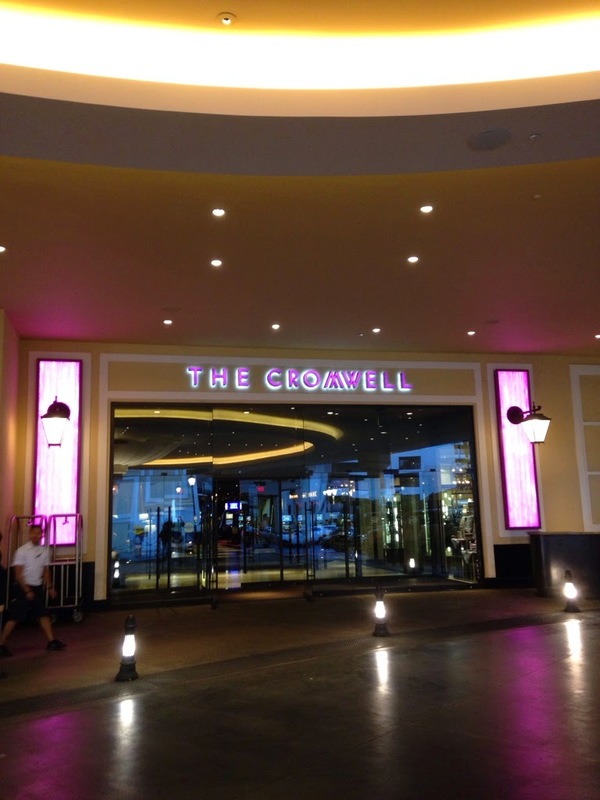 We grabbed a couple of taxis from Wynn and were at the Cromwell in about 5 minutes going the back way. Above is Manette, Ken, Laurie and Mike. It's Tuesday, April 7th and that means it's Laurie's birthday! Happy Birthday Laurie! Also joining us for dinner was Cassie! 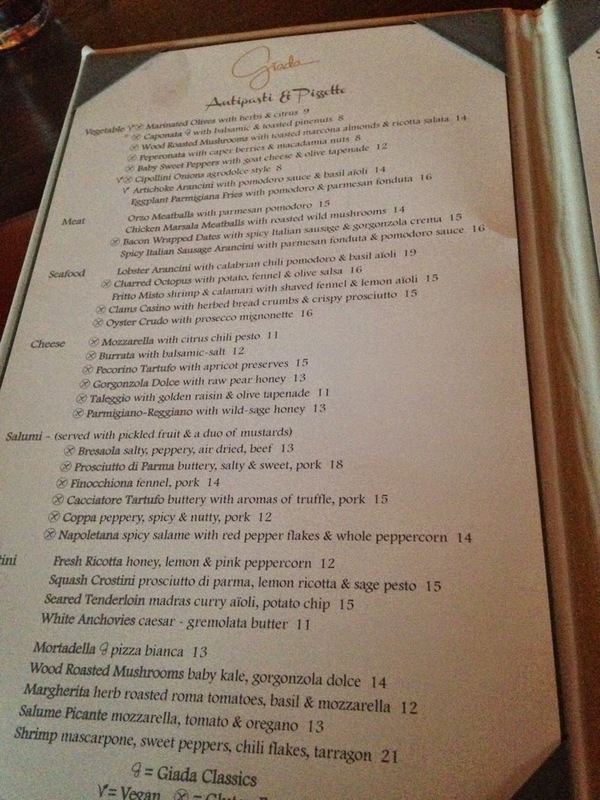 The regular menu, that all of us ordered from with the exception of Manette. I've had a few friends warn me off the tasting menu as not being worth the current price including Kevin and Judy who I had lunch with this morning, so I mentioned that to my friends but Manette decided to give it a try as it does sound good when you read about it. All of us ordered drinks and while last time I was here I loved the La Strada this time I went with the signature drink the Giada cocktail. Notice it has a "G" monogrammed on top of the foam! 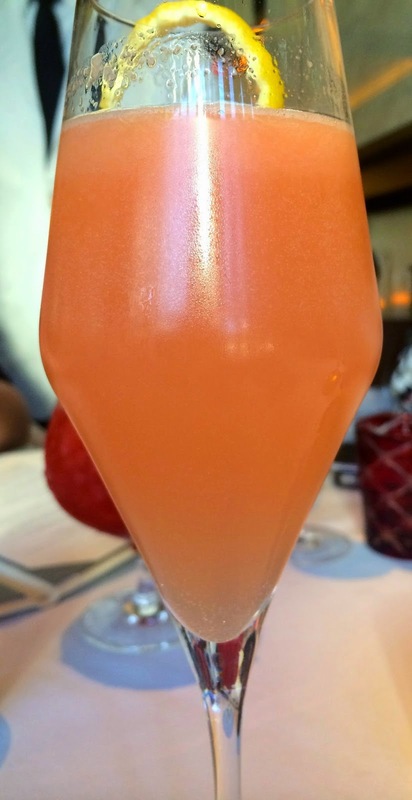 Ken ordered the La Strada that I enjoyed back in September. 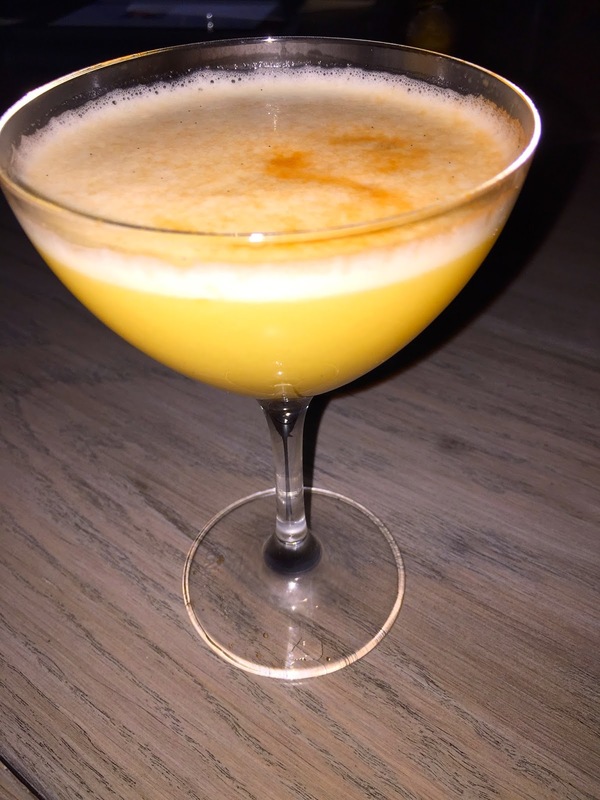 Both drinks are great, though for my personal taste I will give a slight edge to the Giada Cocktail. 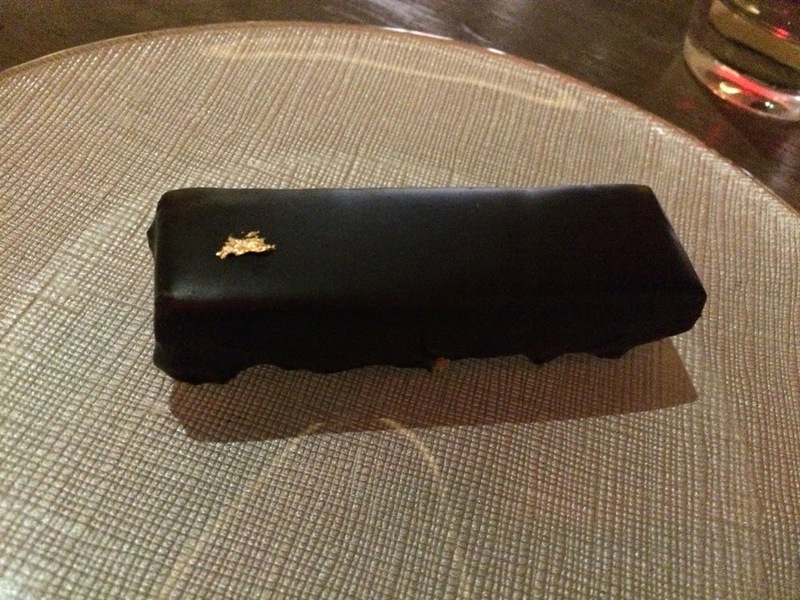 Like last year the complimentary bread was excellent. We had two round ramekins of focaccia, with cracker bread and breadsticks. Accompaniments were garlic puree, mascarpone lemon cream, pepper flakes, fried capers and pink Himalayan salt. Mike's grilled octopus and marinated olives! Arugula, candied lemon, crispy pancetta and parmigiano reggiano. My salad was good but if there was any candied lemon or even lemon flavoring in it, I missed it. Ken ordered the featured soup which was cauliflower with bacon. 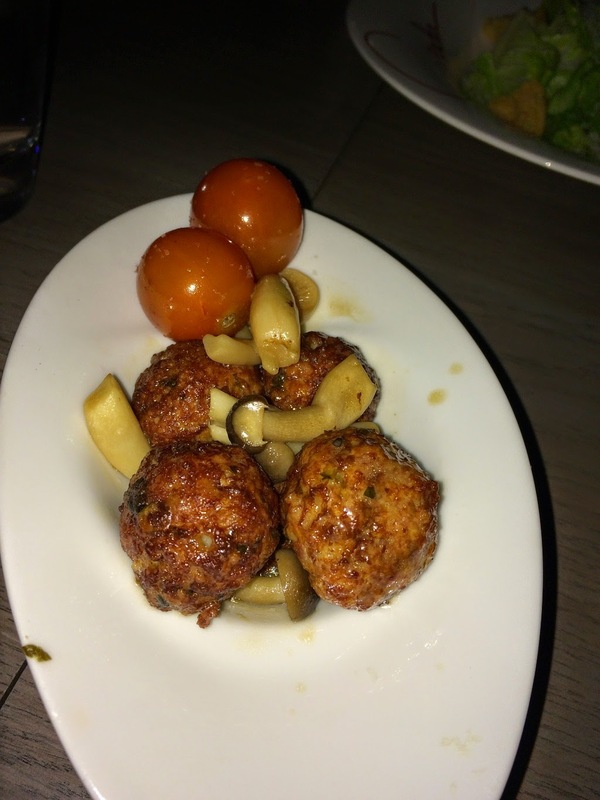 I loved the Orzo meatballs last year so ordered them again. They were good, but not as fabulous as I remember them, perhaps a slight change of recipe? Manette's assorted appetizers from the tasting menu. I wasn't too impressed with the selection though it did have the bacon wrapped dates on the plate. 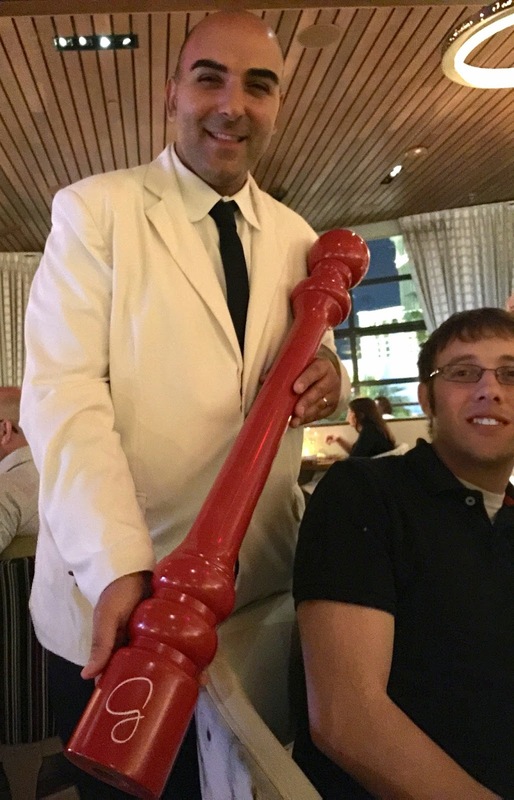 Rocco our server with the giant Pepper grinder because size does count when it comes to grinders. Rocco and our other servers were great and they didn't even sigh when we requested six separate checks! Manette had selected the lemon spaghetti with shrimp from the tasting menu and Mike ordered it too. 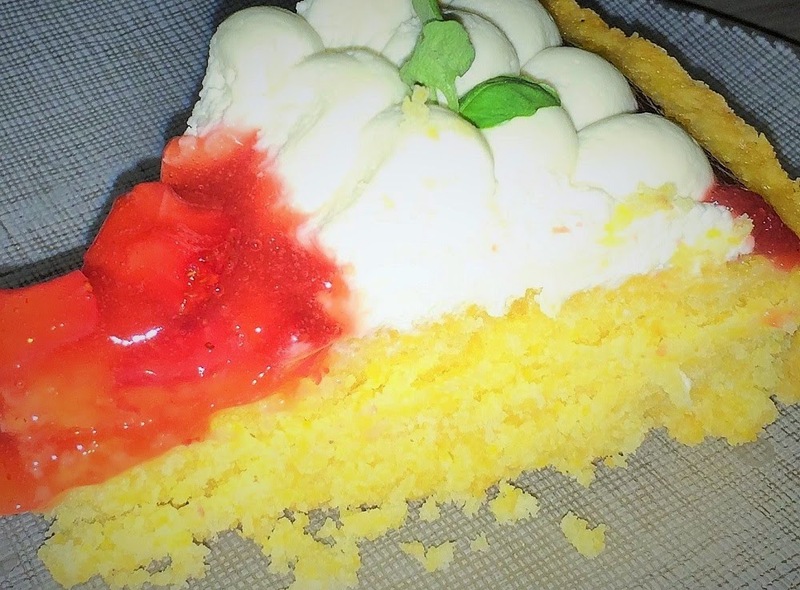 From what I've read this is suppose to be one of the best pasta dishes on the menu but both of them commented there was very little lemon flavor and the predominate taste was mascarpone cheese and they would have preferred more lemon. Perhaps time to change the name of this dish? 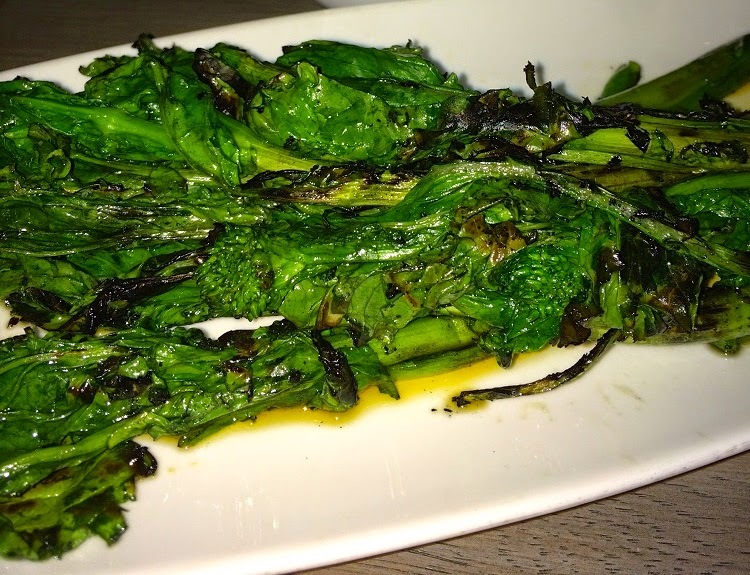 Grilled broccoli rabe from Manette's tasting menu. It was fine, but not outstanding. 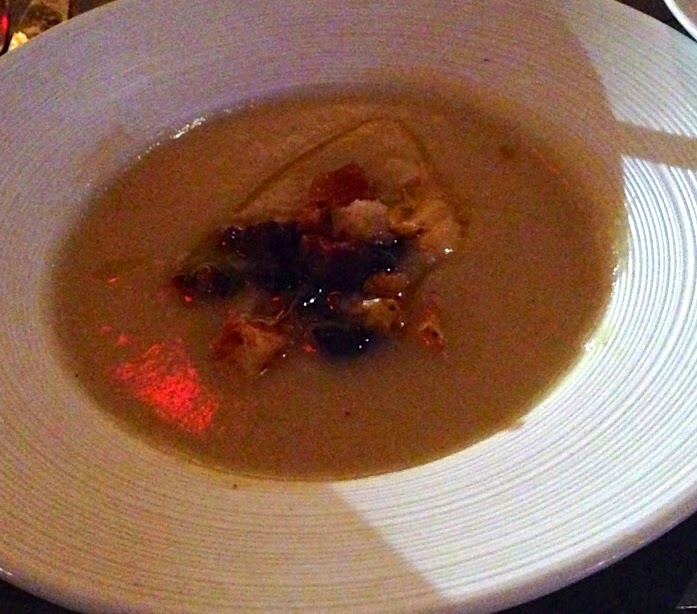 Ken ordered the Roasted Cauliflower with cipollini onion, theme and parmigiano reggiano and said it was good. I think this was Cassie's Rigatoni. Laurie enjoyed the Ravioli with lobster, escarole, piquillo pepper and leek, and said it was very rich! At the end of our dinner she also said she was a bit underwhelmed by Giada. From the tasting menu, Manette's Salmon with pan roasted fall vegetables succotash, lentils and whole grain mustard. Manette said it was fine but she wasn't impressed with it. Last year Terri didn't care for her salmon either. 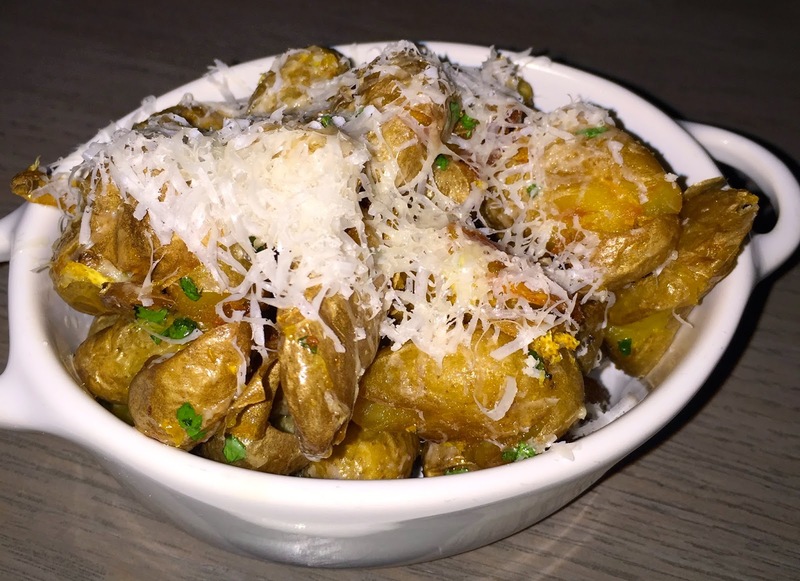 Lemon potatoes from Manette's tasting menu. I tried one of them and they were tasty. I ordered the Surf and Turf which is heavy on the turf and light on the surf. The crab ravioli was large but inside there was just a small bite of crab. The 7 ounce filet was cooked as I asked for it medium and was good. However it wasn't outstanding, I wouldn't order it again. The roasted brussels sprouts were yummy. After our mains, Mike and I order after dinner drinks that might as well have been desserts! They were delicious! Mike had the Meringato Al Limone, Lavazza Gran Riserva, whipped cream, and lemon meringue. I was going to order the same as Mike but Rocco suggested this wonderful drink, Espresso Nocciolato: Lavazza Gran Riserva, Nutella, whipped cream and toasted hazelnuts and it was really great! Both drinks were $9.00 each. 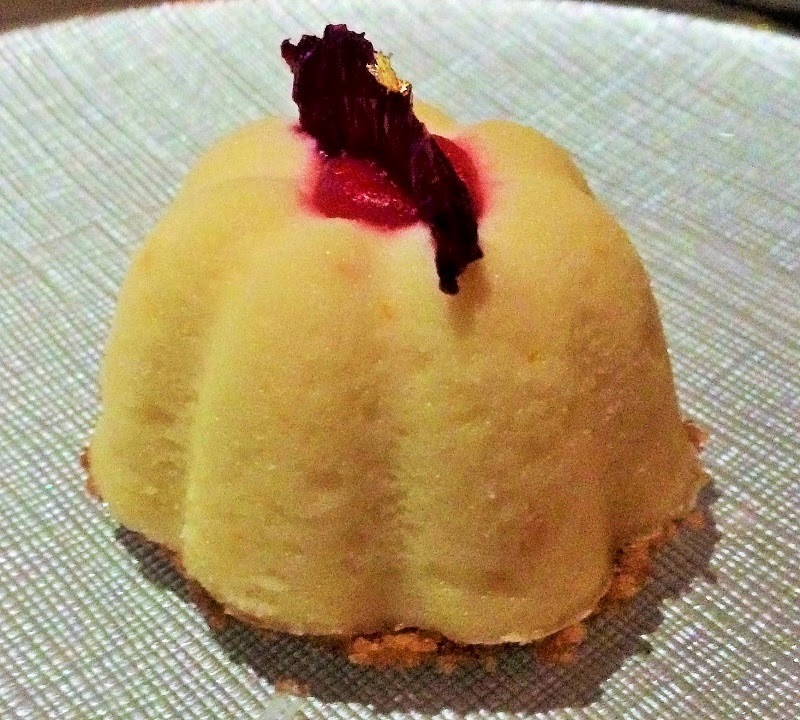 Manette's was encouraged to select three desserts from the desert cart as part of her tasting menu. I didn't try any of them so I'm not sure how good they were but I do remember the cheesecake was popular. Last year they brought the dessert cart around to all the tables and anyone could order from it. This year it's only for those who order from the tasting menu while the rest of us are given dessert menus. Unfortunately I neglected to take a photo of the dessert menu, my bad! Personally I think it was a bad decision to make the dessert cart a selling point for the tasting menu if that's why they made that change. In my opinion people are more likely to order a dessert if you bring the cart around and view the desserts first, then just order blindly off a menu. Photos of the dessert cart. Part of the kitchen you see as you enter and exit Giada. At the end of dinner Manette was not impressed with her tasting menu, instead she felt the same as my other friends, not worth the cost and since four of us including Manette ate at e' Jose Andres the next night it wasn't because she is budget minded. 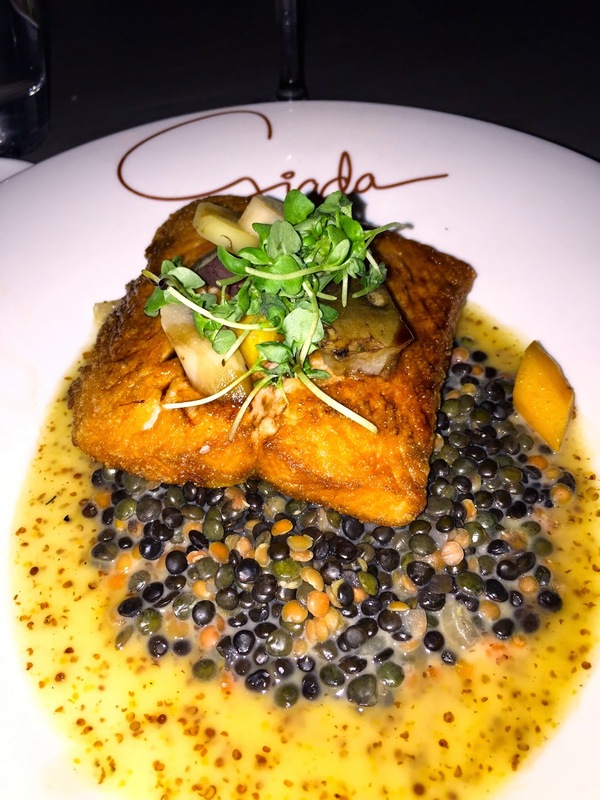 I don't think any of us were blown away by Giada this visit, I certainly didn't think my food or experience was as good as last year with the exception of our servers who were wonderful! This is a pet peeve of mine, restaurants that are not consistent with their food or service. 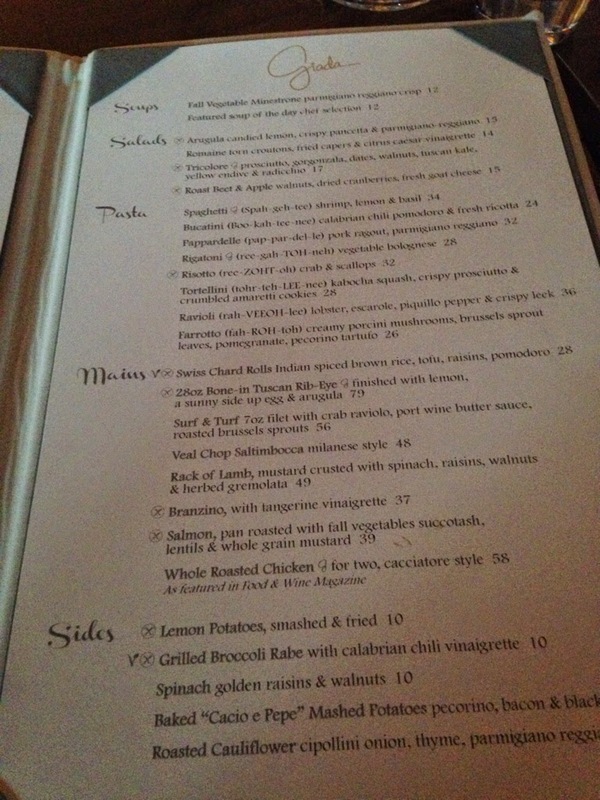 There are a handful of Las Vegas restaurants that I can return to several times a year and always count on great service and wonderful food regardless of time of year or how busy they are, others like Giada can be great sometimes and at other times the food isn't as good even when the menu hasn't changed. On our way out we went to the photo booth I had read about. Somehow I missed seeing this last year and it's so much fun to do with friends! It's complimentary with a choice of emailing your photos, posting them on Facebook or printing them out. 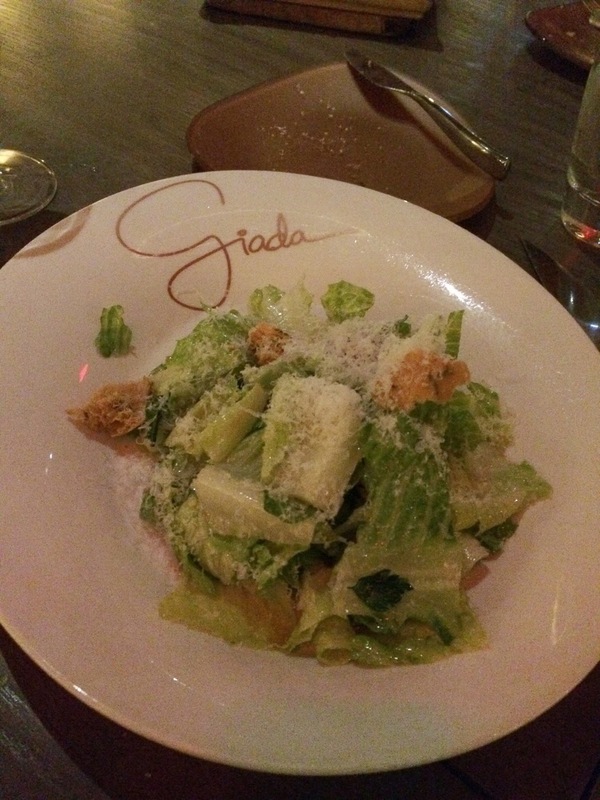 Would I eat at Giada again if friends ask me to join them? Yes, I would return and give it another chance but next time I'll likely just have a few appetizers, a drink and dessert. I did the appetizers only on my solo trip and while with my mom and Hayley. The first time was better, there was no dessert cart for you if you didn't order the tasting menu in December, either. I think it's a big mistake and agree that allowing people to see the dessert cart and order that way is a huge seller. Hopefully they change it back. We also loved the photo booth, which I don't remember from my first visit. Hi Deann, like usual we're on the same page with the restaurants. :) It's easy to miss that photo booth in my opinion unless one has read about it or ends up sitting near it while waiting for a table, but then they usually try to encourage us to sit in the bar area which is why I missed it my first visit. Next month I'm going to try the new restaurant at Bellagio Lago which has fountain views and early reviews on Yelp are positive.